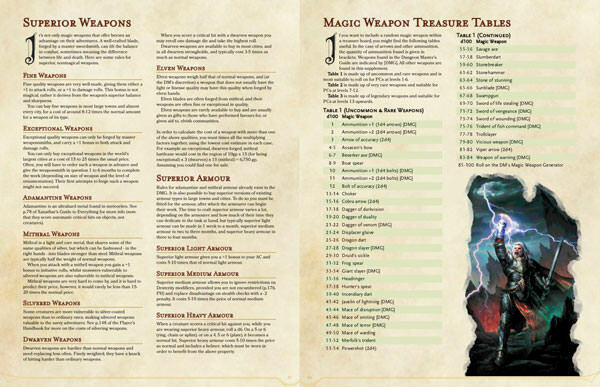 Esquiel's Guide to Magic Weapons presents over 120 new magic weapons for your 5th edition Dungeons & Dragons adventures and campaigns, providing a fun sourcebook for DMs and players alike (and giving you a serious boost to the 30 or so published in the Dungeon Masters Guide!). 120 new magic weapons. With at least one new magic weapon for every weapon type listed in the Player's Handbook. Whether your PC fights with a classic battleaxe or longsword, or a more adventurous halberd, war pick or whip, there's an original magic weapon here for you. 20 new sets of magic armour. At least one new set of magic armour for every armour type listed in the Player's Handbook, from padded to plate. Balanced weapons. The guide was checked by three more DMs for potential balance issues. Familiar mechanics. Ninety percent of the weapons are built using existing 5e mechanics. Specialist class-based weapons. Several weapons (and armour) were designed with specific classes in mind, creating the perfect complement to classes like paladins, rangers, barbarians, and every type of rogue (including swashbuckler). Pop-culture weapons. Mechanics are provided for several popular weapons from pop culture (such as Bobby the Barbarian's club, Hank the Ranger's bow, Wolverine's claws and Xena's chakram). 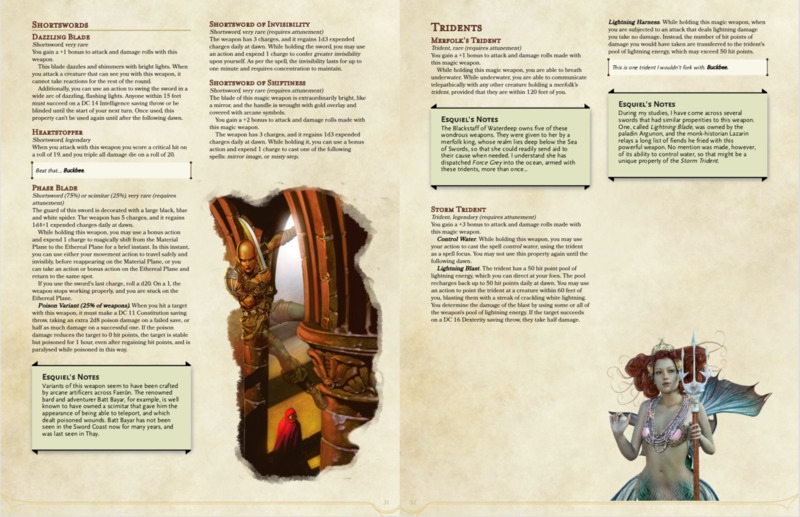 The DM's Magic Weapon Generator Table (author's favourite feature!). Generate near infinite combinations of low to mid-tier magic weapons with this table that features all weapon types, and scores of mix and match minor to medium-power properties. Treasure tables. Tables of magic weapons sorted by rarity (which include both weapons from Esquiel's Guide and the DMG). Superior weapons. Rules for superior non magical weapons, including costs and craft times. Ditto superior armour. Lore. The eponymous military historian Esquiel Fairhand, half-elven, provides some lore and legends around many of the weapons. Puns. Some irreverent comments by Esquiel's halfling servant, Buckbee Brandipot, have found their way onto these pages. Art. Original cover art commission (featuring the medusa flail), and lots of cool stock art inside. Duncan Rhodes is a professional travel blogger and journalist, who also runs the D&D blog Hipstersanddragons.com (because roleplaying is social, creative and fun!). 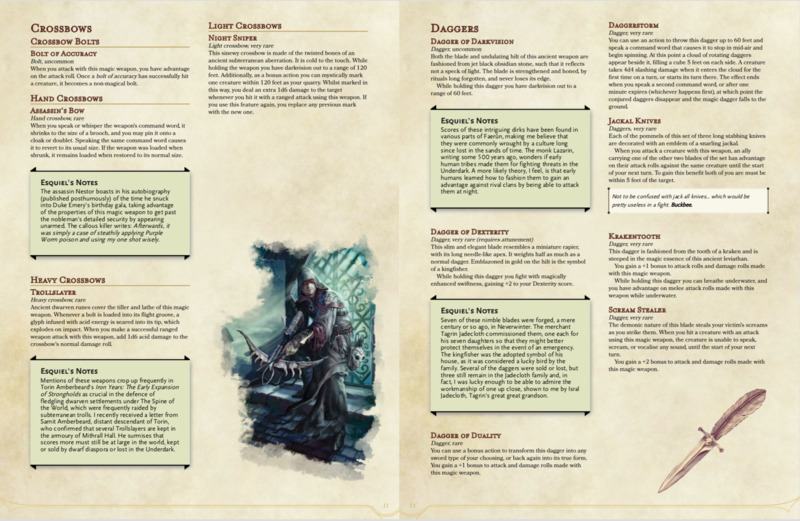 He has published several best-selling titles on the DMs Guilds, such as the old-school flavour adventure The Gleaming Cloud Citadel and this lorebook on the White Scorpions Assassins Guild. Some Waterdeep fun and frolics coming next so do go and subscribe to the blog to stay in touch. So I don't have to painfully go through the two pdfs, did you change anything between them, and which is the more updated one?